Pool Cover Resource has brought the unique Twinscape® Hydrofloor®, variable-depth swimming pool floor to North Texas. Designed and popularized in Europe, Hydrofloors® is the perfect fusion of state-of-the-art-technology with functionality and beauty. Since 1989, the North Texas Dealer for Cover-Pools, Inc. the inventor of the automatic pool cover, over fifty years ago. Whether you plan for a new backyard pool, or you seek relief from the chores and cost of an existing pool—whatever the need—our covers are designed for every pool shape and size. 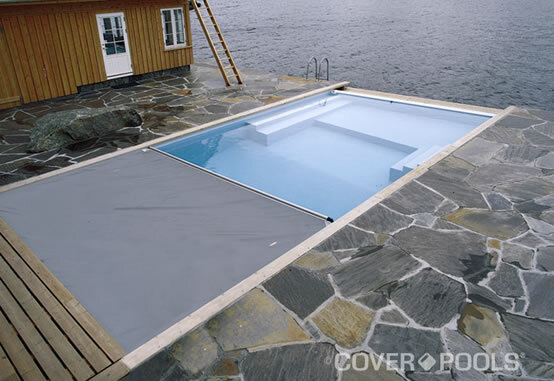 We offer Step-Saver® manual reel cover by Cover Pools®. The Step-Saver® moves through low-profile tracks to cover and uncover the pool, then stores on its own reel when not in use. Even though the Step-Saver® is not motorized, your pool can still be covered in less than 60 seconds! Pool Cover Resource has been protecting pools in North Texas for over 20 years. We can handle design and installation of high-quality covers for all types of in-ground pools - any shape, any size, automatic or manual, existing or just being planned. Pool Cover Resource installs a movable floor in your new swimming pool, to convert it instantly from a swimming pool to a deck or outdoor play space, a dance floor, an entertaining room or even a place to park your car. It will double your yard or floor area, adding valuable footage to your property. To get an estimate using pool drawings and specifications, or to schedule a pool-site estimate just give us a call at 214-321-4029 or use our online form here.